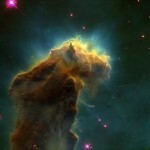 The Eagle nebula is a star-forming factory. It is a huge pillar of gas many light years high. Stars are being formed in the bright tip. Hydrogen gas molecules in the cloud get crowded enough to create gravity. This draws more and more gas until the hydrogen molecules are so close they fuse and begin burning as a star. They continue to grow until they burn off surrounding gas which is why we see the glowing light in the top of the photo. Stars are also being formed in the midst of the dense gases so cannot be seen.